Lately I've been having a great time seeking out and meeting producers and designers in Paris. I especially enjoy meeting artisans who choose to follow their creative whims and dedicate themselves to making something unique to share with the world. I think that's why A Little Market was such a warm and fuzzy find for me. This French version of Etsy unites producers from all around the country (with some Swiss and other Europeans getting in the mix as well) and offers them venue for sharing the fruits of their labor. 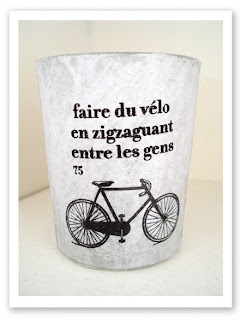 The site is militant in it's support of handcrafted goods and encourages visitors not only to "Achetez Fait Main" but also to get to know the vendors and join in their community. The site also facilitate's local shopping by giving browsers the opportunity to shop by French regions with the use of an interactive map that locates nearby vendors. Memi the Rainbow is an Italian student living in Paris. She makes all things cute and little. Like Japanese-style cute. I don't even like that kind of cute, but I love Memi's online store. Check out her natural cotton shopping bags (32 euro), her cute-as-a-button buttons (where the expression comes from?, 6.50 euro) and her range of office supplies like her notebook covers (20 euro) and pencil bags (25 euro). La Mare à Boutons boutique offers a wide range of handmade products, from necklaces to hand sewn throw pillows, but my favorite item is their bright red polka dotted apron (34 euro) for little helpers in the kitchen or in front of an easel. This cheery tablier promises to make your kid stand out in their "arts plastiques" class at the maternelle! I still haven't figured out what these are exactly. But Limaginarium's creations look pretty cool. Printed on silk paper, each image is a part of the "petits bonheurs" series (which includes "déboucher une bouteille de bon vin" and "trouver un beau couquillage"). I'm not sure how big they are or where you put them, but you could start collecting all the "petits bonheurs" (3 euro each) and figure it out as you go! Fanny's atelier includes prints of old French advertisements mounted on bright backgrounds that would make fun wall decorations in your kitchen. 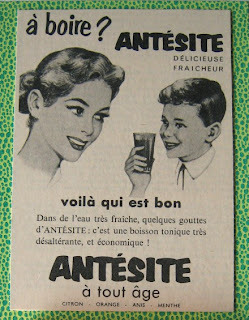 The ads bring you back to a time when it was okay to seek the cure for everything in a bottle. Sore throat? Unflattering thigh fat? Whiny kid? Take a swig! I particularly like this one advertising what seems to be anesthesia for use on children. Oh the 50s! Go and have a look at A Little Market for yourself! Your orders not only encourage local and quality production, but also support these vendors in pursuing their creative endeavors and maybe one day ditching their day job for good! If you like this concept and want to support it, A Little Market will be opening up a real-life boutique from March 8-April 8 at 37 rue des Petites Ecuries, 75010 Paris! 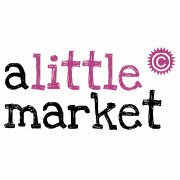 Keep up-to-date with A Little Market by becoming a fan of their Facebook page.